You can find a lot of flashcards on various topics and themes on this site. But what can I do with them? This sounds straightforward, but sometimes it is overlooked: Keep the card hidden from the class, and describe the picture on it. The children have to guess what it is. First, discuss the flashcards with the children: What is it and what is it used for? After that, put numbercards ranging from 1 through 4 on a mat, and use a one syllable flashcard as an example. For instance: Bag. Clap with your hands whilst saying the word on the picture, then point at the children and have them repeat you. Make sure you practice this often. Then ask them how often I had to clap for the word “bag”? Of course the answer is one, so we but the “bag” card under the number one card. Get the next card, for instance a thermometer (You can ask some questions in between, like what is it used for?). Then clap your hands for each syllable in the word, and ask how often I clapped. Put the flashcard under the number with the correct number of syllables, in this case 4. Now, finish off all the flashcards. You can use the flashcards to portray the object on the cards, a sort of drama lesson. Portray something on the card and ask the children what it was. Let the children portray something too, and have the other guess what it is. Print out and laminate the flashcards twice. Leave one set intact, use the second set to separate the word from the picture. Put both sets on the mat and let the youngest children match the pictures of both sets. Have the older children match the words of both sets. Talk about what you see and what it is used for. 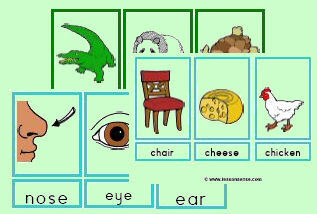 You can prepare the flashcards in advance and have the children play this whenever they want to. Cover half of the card and have the children guess at what is on the card. Reaction skills: Hand out the cards among the children. Every time you call out a specific card, the student with that card has to stand up. Together with the children, think of words rhyming to that specific word.